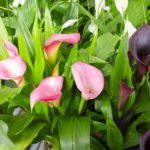 I purchased 3 calla lilies at the same time. All 3 were treated the same in caring, same amount of watering, same amount of sun. One, however, is not making it. The leaves started turning yellow and today the whole plant is wilting. I did transplant two plants when I got home and one I left in the original pot. The wilting plant was one of the ones that was transplanted. The other transplanted plant is doing fine as well as the one left in the pot. What is wrong? Is there any hope for my plant?